In a shallow bowl, whisk together the olive oil and vinegar. Marinate the tomatoes in the mixture, stirring occasionally. Meanwhile, in a small bowl, combine mayonnaise, parsley, oregano, black pepper and 4 teaspoons Parmesan cheese. Spread mixture on each slice of toasted bread. 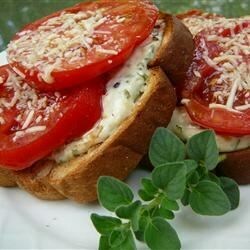 Place marinated tomatoes on 2 slices and sprinkle with remaining Parmesan cheese. for our family and friends who are vegetarian…enjoy as it is or with a nice big bowl of soup…yum!!! try it!